The Imperial War Museum London’s latest temporary exhibition claims to delve “into the pages of well-loved books, bringing five stories of war dramatically to life”. It’s a neat idea. Choose five books which feature wartime situations and use the unrivalled collections of the Museum to illustrate what it was like in the real scenes and situations which are brought to life in the works of fiction. If you know the stories, I can see the attraction. For my under-read self, I found Once Upon a Wartime rather underwhelming and also a little unfocused. Is this an exhibition about the power of stories to express the experiences of war? Is it about the variety and veracity (or falsity) of stories about war? Is it about the need for people to tell stories to make sense of conflict? Is it about the inspiration and development of fictional works? Or is it about five different experiences of war, handily strung together through some pre-existing and well-tested narratives? In a sense, it’s about all these things. We learn about the personal experiences that prompted authors to write about war – for instance Nina Bawden’s own childhood evacuation. We see the notebooks and edited manuscripts of the writers, as well as hear them talk about their writing process. 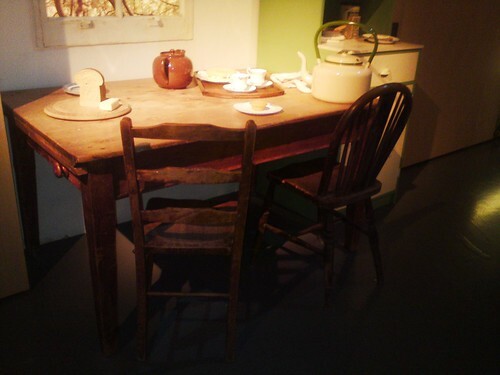 And we see plenty of contemporary artefacts to help us engage with the experiences of people who would have been in situations similar to those featured within the books. Each zone starts with a description of the book, which – be warned – includes revealing the ending. Describing any work of fiction in a couple of hundred words is always a challenge. Do you focus on the plot? Do you reveal the hidden meanings? Do you refer to the ending? While I relied on these descriptions to help me understand the context of each work, I found them frustrating. Surely, I would think every time, there’s more to the book than just that? We then encounter the author, see some of their belongings and writing paraphenalia and listen to their inspiration for writing, and the process they use. For me, these were the most intriguing sections of the exhibition. We discover that Michael Morpurgo writes his stories down, as if he were speaking them, gets a friend to type them up and then makes changes to the typescript in pencil – before it goes to the publisher. “Luckily,” we’re told, “Michael has neat handwriting so the publishers can read his notes”. We see the glass paperweight that sat on Nina Bawden’s desk as she wrote Carrie’s War and the paper knife given to Ian Serraillier which features in The Silver Sword. There’s a school exercise book in which Robert Westall wrote The Machine Gunners, complete with this inscription: “£1 reward for anyone returning this book to Westall, 20 Winnington Lane, Northwich”. And there’s some snapshots of the Thames at Woolwich, which provided the inspiration for the African city in Bernard Ashley’s Little Soldier. We also discover a couple of shared themes. More than one of the featured authors says they started writing as a form of escape after their long day teaching in school. And several also talk about reading their material to children and changing any parts that their audience found boring. A wise move. In amongst all this and the artefacts, there’s a smattering of ‘things to do’. 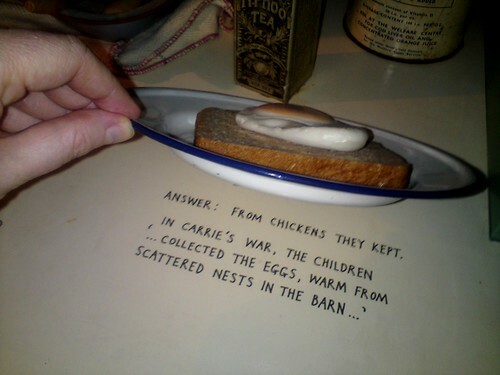 You can hang out in Hepzibah’s kitchen from Carrie’s War and answer the multiple choice questions. The answers are hidden in cupboards and under the breakfast. 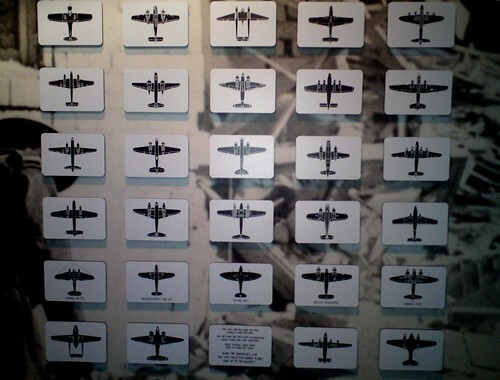 You can use binoculars and a set of RAF identification cards to make out the planes hanging from a ceiling. You can crawl into Chas’s The Machine Gunners fortress, complete with hand-written set of rules: “No 10. Penalty forsplitting to parents, teachers etc. is DEATH.” And you can re-enact the children from The Silver Sword‘s epic journey, tackling challenges to see if you would have made the same choices. If you’ve read the books, I imagine this is all great fun, because you’d also bring additional role play, adventure and dialogue with you. This is where I can see the exhibition doing really well. Roll in a school group who’ve read the book, get them acting out some scenes, encourage them to tell their own stories about the artefacts on display and thinkabout what they’d like to write about. The result? A great museum trip. As an independent visitor, though, I missed much of this. In particular I wanted more about why people tell stories in the first place. With the exception of one notebook that showed a wartime child’s account of playing with aircraft wreckage, where were the unfictionalised accounts of war? I wanted more about stories from other points of view. Couldn’t we have encountered a novel written by a German author about the German experience of the two world wars featured here? And I wanted some kind of opportunity to create your own story. For me this was a major missed opportunity. Given the artefacts and film footage available, couldn’t we have constructed our own story by bringing objects or situations to life in some way? Overall, Once Upon a Wartime suffers from the same challenge TV producers have: how do you demonstrate and bring to life the written word? Like the BBC’s Faulks on Fiction‘s reliance on extracts of BBC adaptations of the books it features, the Imperial War Museum draws on its collection. Not a bad strategy. And actually quite an engaging one if you know the books. But if you don’t know them, you’d be better off investing in a bit of quality reading before you consider forking out for the exhibition.